He and his wife, Roseudys have two sons, Fabián (7/17/10) and Adrián Andrés (9/28/15)...Attended El Carmen High School (VZ) and Colegio Ambrosio Plaza (VZ), where he played basketball. system, and batted .271 (83-for-306) over 96 games...Was signed by San Francisco as a minor league free agent on 2/2, and went to spring training with the Giants. Was signed by Milwaukee to a minor league contract on 4/2...Made two trips to the 7-day disabled list with Colorado Springs, first from 5/1-5/18 (nose fracture) and again from 7/31-8/17 (left ankle sprain)...Batted .288/.389/.468 in 263 plate appearances against right-handed pitchers…Hit just .226/.287/.345 in 94 plate appearances against lefties. Completed his fourth season with the Phillies and batted .192 with seven extra base hits (four doubles, three homers) and 13 RBI in 80 games ... Started 20 games, making 13 starts at second base and seven at third ... Pitched 0.1 of an inning in a blowout 14-1 loss to the Braves on June 7, giving up a two-run home run to Matt Adams for an ERA of 27.00 ... Had just one multi-hit effort all year, a three-hit performance on Sept. 4 at New York-NL. Missed the entire season following right shoulder surgery performed on 2/26 (Dr. David Altchek). Spent the season with Lehigh Valley (AAA)...Set a professional high in HR (10)...Had 2 walk-off HR: 5/21 vs Louisville and 8/1 vs Pawtucket...Missed 5 games with a strained knee, 6/7-12...Tied his professional high with 4 hits, 6/18 at Toledo...Missed 9 games with a sore right elbow, 6/28-7/5...Made lone start at 2nd base, 7/12 at Norwich...Slugged a grand slam and had a season-high 4 RBI, 7/23 vs Columbus...Played for Magallanes in the Venezuelan Winter League. Played in just 36 games in final season with TEX...hit career-best 2 home runs, both of which were solo shot and accounted for 2 of season's 3 RBI...in 18 starts, including 16 at shortstop, the Rangers finished 11-7...was placed on 15-Day DL, July 7-31, with stress reaction in back...returned to DLAugust 9-Sept. 1 with lower back inflammation. Made his first career Opening Day roster and appeared in a career-high 68 games for Texas after being obtained from Chicago-NL late in spring training to compete for club's utility infielderrole ... was club's Opening Day starter at second base for injured Ian Kinsler...was a non-roster invitee to Cubs camp for asecond straight year in 2010...suffered a right knee sprain inMarch, but returned to the field shortly before the trade and appearedin 7 Cactus League games with Texas (6-for-19, 3 RBI) ... received the majority of his playing time with the Rangers in Apriland August at second base while Kinsler was on the disabled list ... also saw limited action at shortstop and third base ... establishednew career highs in most offensive categories ... went more than12 team games without playing on 2 occasions. Andres began the year at Triple-A, but saw big-league action in 53 games with Chicago ... it marked his first major league action since spending parts of three seasons with the Royals (2004-06)...Batted .252 (31-for-123) with 15 runs, eight doubles, a homer and 12 RBI in 53 games with the Cubs ... set career marks in all categories...Was selected from Triple-A Iowa May 27 ... made 40 appearances (21starts) at second base and 15 (nine starts) at shortstop.w Garnered a .983 fielding percentage (3 ER/172 TC)...Batted .346 (9-for-26) with four doubles and five RBI in situationsdeemed "close and late. "© Had a pair of season-high five-game hitting streaks: June 19-23 (7-for-21/.333) and July 29-September 6 (5-for-11/.455) ... fell a game shortof matching his career-high six-gamer, April 18-25, 2004...Hit .500 (3-for-6) with a double and six RBI with the bases loaded...Posted a .310 batting average after the Mid-Summer Classic comparedto a .222 mark prior to the All-Star Break...Went 6-for-23 (.261) as a right-handed batter, while going 25-for-100(.250) as a lefty...Notched his first career pinch-hit July 20 in Philadelphia, doubling in thefifth inning before coming around to score...Hit his first career homer July 29 vs. Houston, going deep off Doug Brocailin the eighth after entering as a defensive replacement at shortstop...Was batting .314 (48-for-153) with 18 runs, nine doubles, four homersand 25 RBI in 43 games for the I-Cubs at the time of his promotion ...hit .352 (25-for-71) in May as the team's regular shortstop...Was shelved August 4-September 1 with a left calf strain ... hit .280 (21-for-75) with 12 runs, eight doubles, two triples, two homers and four RBIin 20 rehab games with Iowa...Collected a career-high matching three hits September 13 vs. Cincinnati... he set the mark September 11, 2005 at Detroit, while with KansasCity...Overall, batted .304 (70-for-230) with 30 runs, 17 walks, 17 doubles,two triples, six homers and 29 RBI in 64 games with the I-Cubs. Andres bounced back from an injury-riddled 2007 to appear in 102 games with Triple-A Iowa ... hit .285 (85-for-298) with a career-high 36 RBI...Saw time at shortstop (94 games), second base (two) and third base (one)...Hit .292 or better in three months: .292 in April, .317 in May and .350in August...Batted .293 (66-for-225) off right-handed pitchers compared to .260(19-for-73) off southpaws...Garnered a .320 home average (49-for-153) compared to a .248(36-for-145) average on the road...Posted a .286 average (61-for-213) before the All-Star break whilehitting .282 (24-for-85) following the break...Boasted an .857 average (6-for-7) with 10 RBI with the bases loaded ...hit .345 (19-for-55) with runners on and two outs...Collected two season-high seven-game hitting streaks: April 16-22 andMay 24-June 2...In 46 games with Aguilas del Zulia of the Venezuelan Winter League, hit.272 (46-for-169) with 12 doubles, a homer, 22 runs and 18 RBI. Played just 28 games with Triple-A Omaha before landing on the disabled list May 31 with a right hamstring strain...Hit .196 (19-for-97) before his injury, seeing time at shortstop (21 games) and second base (seven games)...Posted a .313 batting average (15-for-48) with six runs scored on theroad...Hit .292 (7-for-24) off left-handed hurlers...After going just 3-for-35 (.086) in 11 April contests, he went 16-for-62(.258) in 17 May games. Recorded a .241 (21-87) average with 4 doubles, 1 triple and 9 RBI in 33 games for the Royals...appeared in 25 games at shortstop and 7 at second base...Hit .500 (9-18) with 5 RBI against left-handers and .174 (12-69) with 4 RBI vs. right-handers...hit just .182 (10-55) in innings 1-6 and .344 (11-32) from the7th inning on...hit .455 (10-22) leading off an inning...Hit .237 in 88 games for Omaha, recording 9 doubles and 20 RBI...went 6-for-10on stolen base attempts and committed 21 errors...was also hit by a team-high9 pitches...was named to the Pacific Coast League All-Star team...Recalled from Omaha on May 19 after hitting .282 (37-131) with 1 HR and 14RBI in his 1st 38 games...Appeared in 6 games for Kansas City, including 5 starts, while collecting 3 hitsin 17 at bats (.176) before being optioned back to Omaha on June 3...Began his 2nd stint with the big league club when he was recalled July 25from Omaha...collected 2 hits in each of his 1st 2 starts, July 28-29 at Texas...equalled a career high with 2 RBI on July 28...Committed 2 errors on Aug. 3 vs. Minnesota...it was the 1st 2-error game of hiscareer...Recorded a career-high 3 RBI on a bases-clearing double during the Royals 6-runrally in a 10-4, 12th-inning win at Boston on Sept. 9...Left the game on Sept. 24 vs. Detroit after injuring his shoulder during a swingin the 9th inning...Underwent surgery on Sept. 29 to repair a posterior labrum tear in his leftshoulder...Dr. Lewis Yocum performed the surgery in Los Angeles. Opened the season at Omaha (AAA) before suffering a knee injury...was hitting .196 (10-51) prior to the injury...played at High Desert (3 games), Arizona (7 games) and Wichita (9 games) on rehab assignment until returning to Omaha on Aug. 15...Finished with a .254 average (29-114) in 35 games for Omaha with 4 doubles,2 triples and 1 home run...his homer came on April 9 and was his 1st in 1,119minor league at bats (counting Dominican League at bats)...Was recalled from Omaha on Sept. 5...played in 26 games for the Royals, batting.215 with 6 runs and 5 RBI...hit .292 (7-24) in his final 7 games...played 24games at 2nd base after spending the majority of his career as a shortstop. Opened the season with Wichita (AA)...was batting .292 (7-24) with 1 RBI in 8 games for the Wranglers when his contract was purchased on April 17...Made his big league debut as the starting shortstop at Minnesota that night and went 0-for-3...Became the 2nd youngest Royal in club history (behind only BretSaberhagen) when he made hisdebut at 20 years, 6 days...becamethe youngest position player ever to play for KC...Was the youngest current Major Leaguer at the time of his promotion...Recorded his 1st Major League hit on April 18 at Minnesota, a bunt single in the3rd inning...Hit a 2-run single on April 20 at Cleveland for his 1st Major League RBI...Optioned to Wichita (AA) on April 29 after hitting .259 (7-27) in 9 games...Recalled from Wichita on Aug. 10 and optioned back on Aug. 23...appeared in 10games during his 2nd stint with KC, hitting .364 (12-33) with 6 runs, 2 doubles,1 triple and 2 RBI...Named as Best Defensive Shortstop in the Texas League by Baseball America...selected as a member of the World Team for the 2004 Futures Game inHouston. Spent the season with Single-A Wilmington, hitting .244 (96-for-394) in 113 games...Named the best defensive shortstop in the Carolina League by Baseball America following the 2003 season. Spent the majority of the season with the Gulf Coast League Royals in his second year in the Royals organization ... hit .249 with 27 runs and 14 RBI in 52 games with the club. Spent his first season in the Royals organization with their Dominican Summer League club, hitting .298 (56-for-188) in 54 contests with 39 runs scored, three triples, 16 RBI and 28 walks. January 28, 2019 3B Andres Blanco assigned to Gwinnett Stripers. December 5, 2018 Atlanta Braves signed free agent 3B Andres Blanco to a minor league contract and invited him to spring training. November 2, 2018 1B Andres Blanco elected free agency. 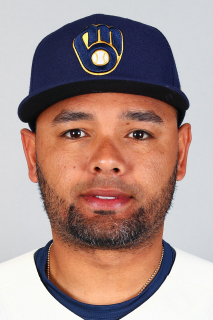 October 23, 2018 3B Andres Blanco assigned to Navegantes del Magallanes. August 18, 2018 Andres Blanco roster status changed by Colorado Springs Sky Sox. August 1, 2018 Colorado Springs Sky Sox placed 3B Andres Blanco on the 7-day disabled list retroactive to July 31, 2018. May 18, 2018 Colorado Springs Sky Sox activated 3B Andres Blanco from the 7-day disabled list. May 3, 2018 Colorado Springs Sky Sox placed 3B Andres Blanco on the 7-day disabled list retroactive to May 1, 2018. April 3, 2018 2B Andres Blanco assigned to Colorado Springs Sky Sox. April 2, 2018 Milwaukee Brewers signed free agent 2B Andres Blanco to a minor league contract. March 31, 2018 Richmond Flying Squirrels released 2B Andres Blanco. March 23, 2018 2B Andres Blanco assigned to Richmond Flying Squirrels from Sacramento River Cats. February 6, 2018 2B Andres Blanco assigned to Sacramento River Cats. February 1, 2018 San Francisco Giants signed free agent 2B Andres Blanco to a minor league contract and invited him to spring training. November 2, 2017 3B Andres Blanco elected free agency. October 15, 2017 3B Andres Blanco assigned to Navegantes del Magallanes. December 14, 2016 Philadelphia Phillies signed free agent 3B Andres Blanco. November 3, 2016 2B Andres Blanco elected free agency. September 2, 2016 Philadelphia Phillies activated 2B Andres Blanco from the 15-day disabled list. April 5, 2015 Philadelphia Phillies selected the contract of 2B Andres Blanco from Lehigh Valley IronPigs. November 13, 2014 Philadelphia Phillies signed free agent 3B Andres Blanco to a minor league contract and invited him to spring training. November 13, 2014 3B Andres Blanco assigned to Lehigh Valley IronPigs. October 24, 2014 3B Andres Blanco elected free agency. October 17, 2014 Philadelphia Phillies sent 3B Andres Blanco outright to Lehigh Valley IronPigs. October 7, 2014 3B Andres Blanco assigned to Navegantes del Magallanes. June 29, 2014 Philadelphia Phillies selected the contract of 3B Andres Blanco from Lehigh Valley IronPigs. May 15, 2014 Lehigh Valley IronPigs activated SS Andres Blanco from the 7-day disabled list. March 30, 2014 SS Andres Blanco assigned to Lehigh Valley IronPigs. November 20, 2013 Philadelphia Phillies signed free agent SS Andres Blanco to a minor league contract and invited him to spring training. November 20, 2013 Andres Blanco assigned to Lehigh Valley IronPigs. November 4, 2013 SS Andres Blanco elected free agency. September 18, 2013 Lehigh Valley IronPigs activated SS Andres Blanco from the 7-day disabled list. April 3, 2013 Lehigh Valley IronPigs placed SS Andres Blanco on the 7-day disabled list. March 18, 2013 SS Andres Blanco assigned to Lehigh Valley IronPigs. March 2, 2013 Philadelphia Phillies signed free agent SS Andres Blanco to a minor league contract. February 15, 2013 Lehigh Valley IronPigs released SS Andres Blanco. December 13, 2012 Philadelphia Phillies invited non-roster SS Andres Blanco to spring training. October 11, 2012 2B Andres Blanco assigned to Navegantes del Magallanes. March 31, 2012 Philadelphia Phillies signed free agent SS Andres Blanco to a minor league contract. March 31, 2012 SS Andres Blanco assigned to Lehigh Valley IronPigs from Philadelphia Phillies. March 29, 2012 Washington Nationals released SS Andres Blanco. December 16, 2011 Washington Nationals signed free agent SS Andres Blanco to a minor league contract and invited him to spring training. November 4, 2011 SS Andres Blanco elected free agency. November 2, 2011 Texas Rangers sent SS Andres Blanco outright to Round Rock Express. September 30, 2011 Andres Blanco roster status changed by Texas Rangers. September 1, 2011 Texas Rangers activated SS Andres Blanco from the 15-day disabled list. August 29, 2011 sent SS Andres Blanco on a rehab assignment to Round Rock Express. August 9, 2011 Texas Rangers placed SS Andres Blanco on the 15-day disabled list. Lower back inflammation. July 31, 2011 Texas Rangers activated SS Andres Blanco from the 15-day disabled list. July 28, 2011 sent SS Andres Blanco on a rehab assignment to Round Rock Express. July 8, 2011 Andres Blanco roster status changed by Texas Rangers. July 7, 2011 Texas Rangers placed SS Andres Blanco on the 15-day disabled list. March 27, 2010 Chicago Cubs traded 2B Andres Blanco to Texas Rangers. October 7, 2009 IF Andres Blanco assigned to Navegantes del Magallanes. September 1, 2009 Andres Blanco roster status changed by Chicago Cubs. August 11, 2009 sent SS Andres Blanco on a rehab assignment to Iowa Cubs. August 4, 2009 Chicago Cubs placed 2B Andres Blanco on the 15-day disabled list. Left calf strain. May 27, 2009 Chicago Cubs selected the contract of 2B Andres Blanco from Iowa Cubs. August 2, 2000 Kansas City Royals signed free agent SS Andres Blanco to a minor league contract.